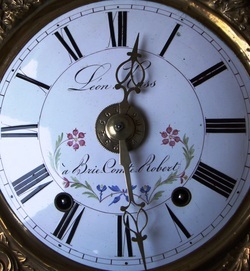 Comtoise HQ is the online home of my pastime / passion / obsession - restoring and writing about antique French clocks, namely the iconic Comtoise clock. These colourful and provocative French longcase clocks, sometimes referred to as Morbier clocks, are a much overlooked cousin of the more formal English longcase or 'grandfather' clock and are more available and accessible than the seldom-seen Swedish Mora Clock. I operate from a small workshop adjacent to my house in leafy Cheltenham at the edge of the Cotswold Hills in Gloucestershire, England, and I have a similar facility in deepest Andalucia in southern Spain. When I'm not busy in either location, I'm usually working my way through rural France in a discretely maturing Mercedes Estate, foraging through barns and Brocantes for (usually well-disguised) horological treasure. Please click through the pages above to see past and current restoration projects, as well as more details of my own, recently published book (November 2016) and other books on the subject, including prices and availability.